I rolled up to Scarlett Payne’s farm and she greeted me with a friendly “You must by my biking friend!” Her mother was there to get some goat milk for a baby llama, so we headed out to the barn with Radar the dog and her daughter Tiffany to milk a couple of goats. Scarlett is a Certified Natural Health Practitioner, and a big believer in the importance of drinking milk raw, complete with its natural enzymes and bacteria. 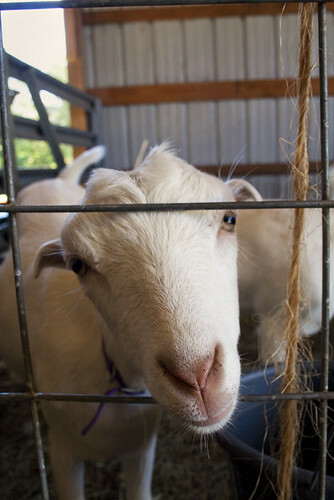 Therefore, she runs her farm as a goatshare program, so people sign a private contract, essentially paying Scarlett to take care of their goats so they can consume the milk they produce. She raises her animals without hormones, on hay raised on the farm with no pesticides, and with no organic certification. Although everything she does is “organic,” and she has plans to install a Grade-A pour-through milking system in her barn, Scarlett has convinced me that state and federal regulations are what make farming so expensive, and especially dairy (or meat) farming. 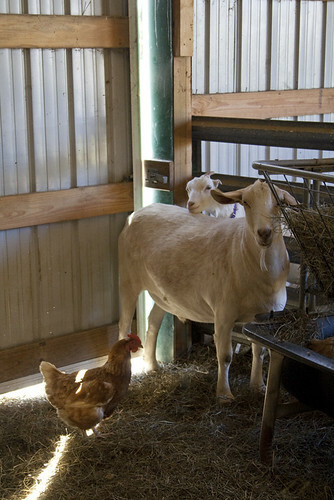 She raises her own hay, composts her manure, and rotationally grazes her goats on pasture. 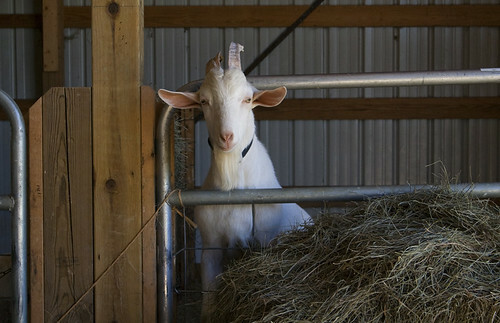 Without having to pay extra for certified inspectors and processing fees, Scarlett sells milk at $3.50/quart, and profits from these sales – from milk from only six goats – has paid for their hay, grain, and significant farm upkeep and improvements. 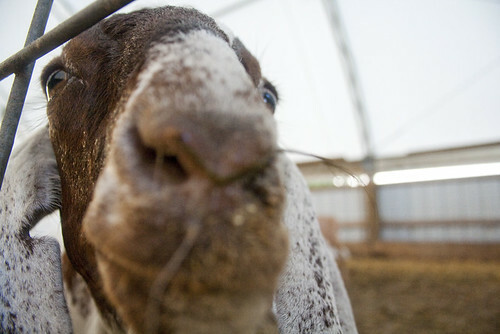 Worldwide, goat meat and milk are the most consumed of any dairy animal. They consume vastly less energy and food as cows, and produce much more milk than sheep, and they can survive in much harsher environments than other species. In addition, goat milk is healthier and easier to digest than cow’s milk – many people who are unable to digest cow milk are not lactose intolerant at all. Goat milk just digests faster than cow milk because the protein and fat molecules are smaller – it makes sense; goat calves are much closer to human baby size than cow calves are. Goat milk is also high in organic sodium, which maintains the body’s pH and makes the stomach more able to digest proteins. See, I learned a lot from Scarlett! 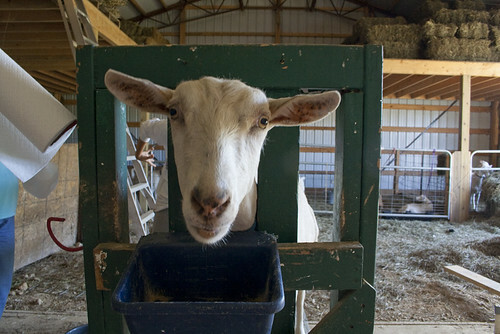 And, the goat milk was so tasty I have no reason to doubt any of it. Her goats are almost all Saanen goats, which are the best milkers. 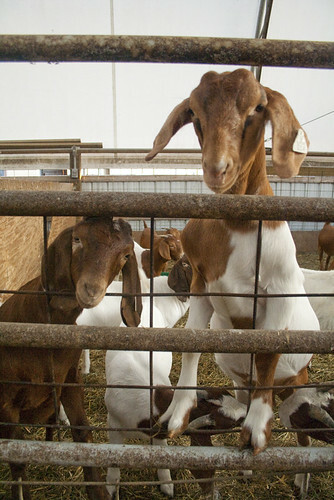 She also has had La Mancha goats and crossbred Nubians. Right now she is milking 6, but her dream is to have 20 milkers, producing 20 gallons of milk a day. 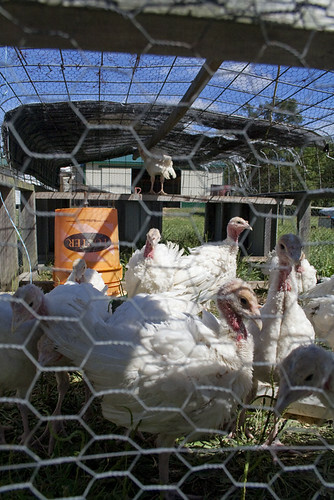 She also raises turkeys and chickens, I mobile cages that she drags across the grass every day with a two-wheeler, leading the clucking birds to fresh new grass that they gobble up eagerly. I had never made goat yogurt before, and the goat cheese we made at La Chevalerie was “goaty” enough that I would never have expected a creamy yogurt to result from the milk. Scarlett’s milk proved me wrong, however – the taste was sweet and delicious, smooth and drinkable. It wasn’t like the thick yogurt that I try to make with cow’s milk, but it was delicious, and if I can get my hands on good goat milk again, I certainly will jump on the opportunity! 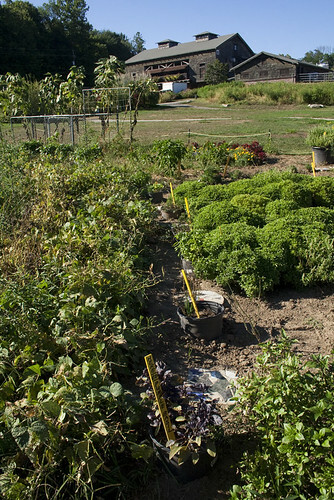 I learned about Earl and Mickey Smith’s farm by chance from a volunteer at Freewheelin’ Bikes in Indianapolis, and I was excited to visit an Organic Valley Co-op farm. 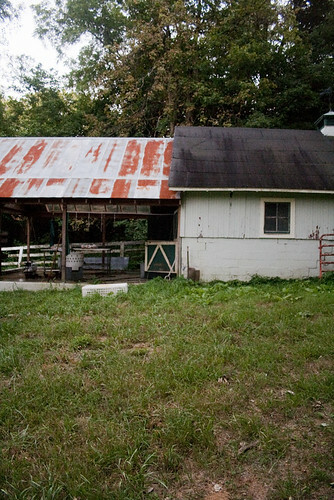 Camille Farms is a fourth-generation dairy – Earl’s son Mickey took over in 2008, after managing the Kroger produce department for 8 years, and he has dreams of expanding the dairy in partnership with a friend, and starting a farm store to sell products made on the farm as well as other local, organic products. 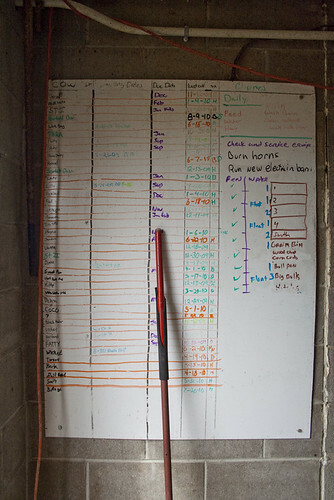 The Smiths’ herd is made up of crosses between Jersey and Guernsey cows, and Mickey keeps track of all of the cows on an impressive board with all of their names right inside the door of the milking parlor. 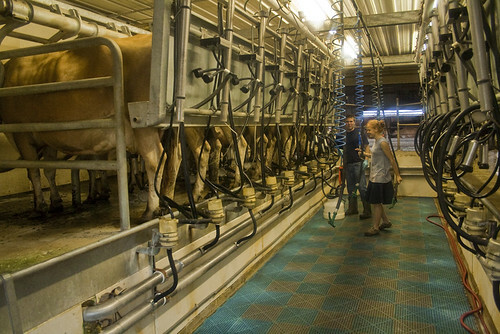 They’re milked twice daily, and it takes about 1 ½ hours each time to milk all 28 cows. 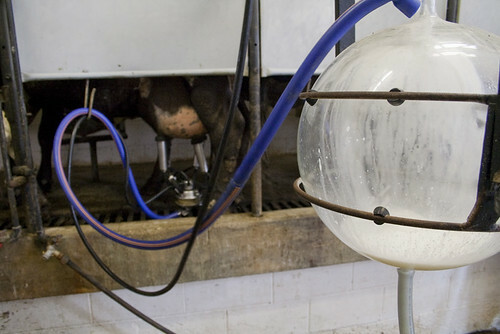 The milking parlor was built in the 1970s and sports awesome round globes where the milk is held. When the milking machine is pumping, I felt like we were watching over some great Cold War nuclear experiments. A calf was born the night before I arrived, and “Josh” was a real sweetie. Mickey’s friend Lexie strokes his head and he seemed to really enjoy it, unlike the two poor skittish calves that Mickey’s nephew riled up. Earl has been an active member of the Hancock County community for years, and he’s a real advocate of real, organic food as a leader in the Buy Fresh Buy Local movement. 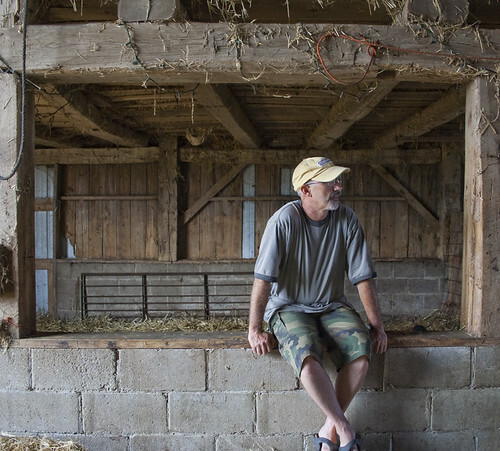 He and his wife Barbara go to a handful of local markets each week, selling milk and dairy products from the farm, Organic Valley, and other local producers. I was intrigued by what I saw at Camille Farms; the Smiths are a well-established local family like the Kilguses. Camille Farms’ current and future marketing is focused on staying small and local by going organic, currently through the Organic Valley co-op, but Mickey’s aspirations lie in a more direct farm-to-consumer organic network. 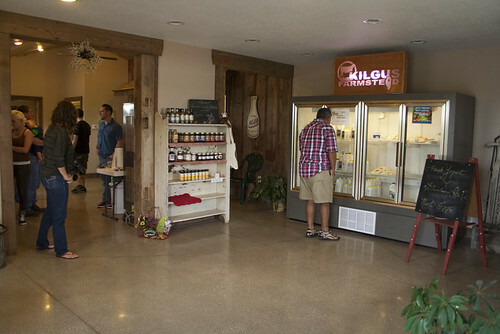 The Kilgus dairy has refocused their marketing to a specific niche – pastured and grass-fed, but more importantly, they process and bottle on-site – which has retained their local market but also expanded to a speciality market in Chicago and Indiana. I truly wish the best of luck for Mickey and his hopes for taking over the farm; it’s a beautiful herd, a good farm, and he works incredibly hard to keep the place running and flourishing every day. I made it out of Indianapolis, which was quite a climb, much to my surprise, and made it to Apple Family Farm by mid-morning. Mark and Nora welcomed me in their store, which sold an impressive array of locally produced products – meat, milk, cheese from dairies including Traderspoint and the Swiss Connection, as well as honey and soaps and candies and even some books. All of their business comes out of this shop, and their raw milk cowshares. 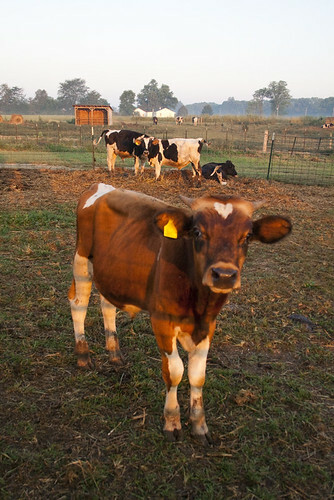 It is illegal to sell raw milk in Indiana for human consumption, but Apple sells their milk to people who own a share of the cow, and sells raw dairy products from other farms (and this is method used at Traderspoint) exclusively to be given to pets. 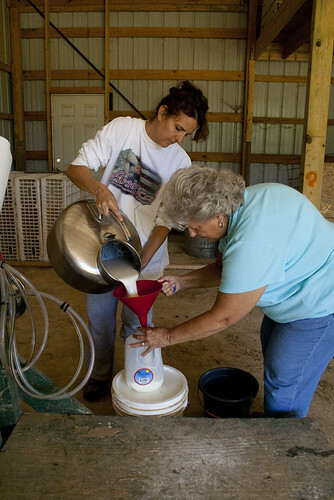 Every state has different regulations regarding raw milk, but farmers everywhere go to a lot of effort to provide raw milk for consumers who demand it. Most of Apple Family Farms’ customers connect with them through the Weston A. Price Foundation, one of the country’s biggest advocates for raw milk – they even have a lobby in Washington, DC – as well as other traditional, nutritious foods. According to their website, they are “dedicated to restoring nutrient-dense foods to the human diet through education, research and activism.” Because Mark’s customer base is so small and local, there’s no need for him to have organic certification, even though he’s done everything organically since re-starting the farm 11 years ago. He raises his own hay, but hasn’t yet made it through a winter without having to buy some. One of Mark’s customers Mike arrived – he’d heard about my visit and has recently gotten interested in making his own ice cream and sour cream – and the three of us headed out to see the farm. Mark is a third generation dairy farmer on this land, but when he grew up his father hated dairy farming so by the time he retired the dairy was no longer used. 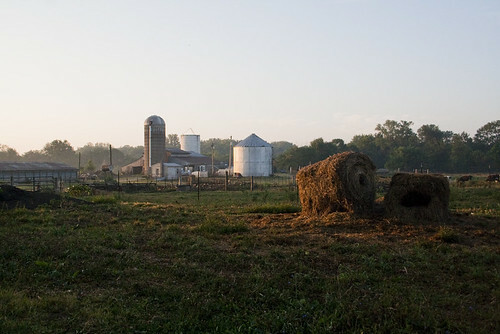 Mark returned to Indiana from Tennessee eleven years ago and restarted the farm – the milking parlor and holding tank are still original from the 1950s, when they were built for Mark’s parents as a wedding present. 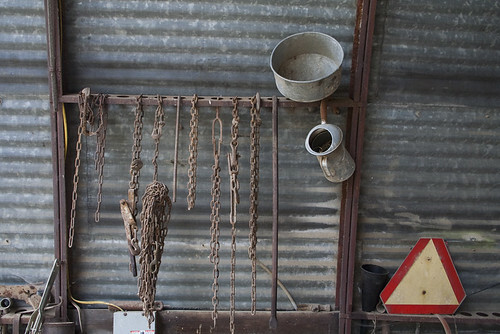 At the time it was revolutionary, a “pet parlor” system with raised floors for the cows to make milking easier. This it the expected system now, but was the talk of the county when it was installed decades ago. Mark’s herd of 25-30 milking cows is mostly the Dutch Belted breed, a funny-looking cow, black with a white belt around the waist. They were first brought to the US by PT Barnum for the circus, but Mark chose them for his herd because of their genetic purity and suitability for grazing on grass. 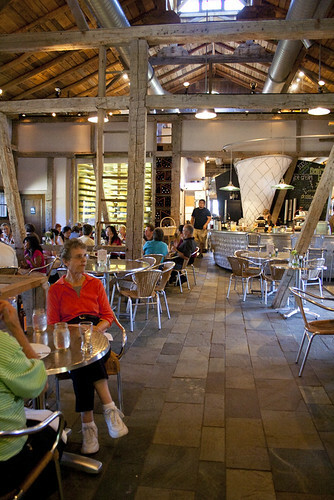 I pulled into Traderspoint Creamery on a hot Thursday afternoon, and it was bustling with activity. Steven directed me to a couple of possible tent sites, and I set off to explore the grounds. 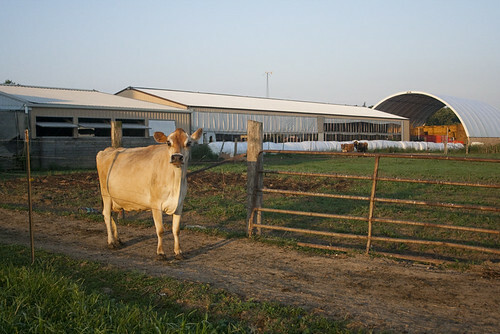 TPC occupies a total of over 240 acres on both sides of Eagle Creek, where the farm and creamery buildings are located as well as the pastures for the milking herd. (Another 200 acres is leased to grow organic hay.) 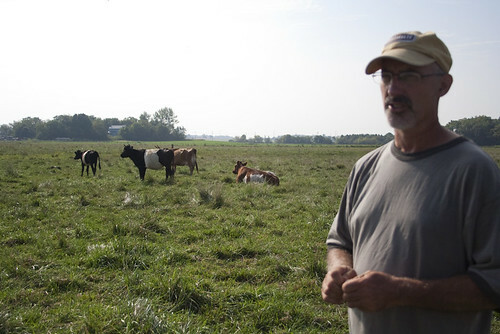 Like at Kilgus, the herd is grazed rotationally, depending on grass conditions, weather, and herd characteristics. Bordering the public part of TPC is Eagle Creek – a nice path skirts under the trees, and I started my wanderings here. Eagle Creek is also a major Indianapolis watershed, which adds additional importance to TPC’s dedication to its cleanliness and organic runoff from the farm. I turned off the creek path and headed toward the cows, who were grazing in the far corner of the most distant pasture. That’s where I found them again on Friday morning, just as dawn was breaking. 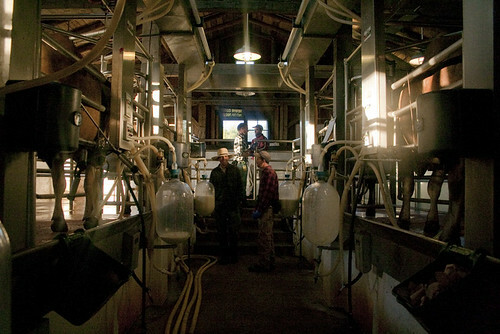 Mark, Michael, Will, and I found each other in the darkness at 6:00, and by 7:00 the herd had made it up to the milking parlor. 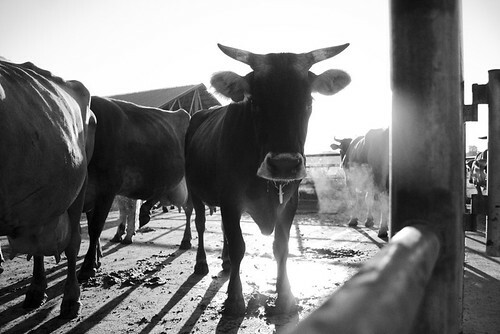 TPC’s milking herd is made up of about 60 Brown Swiss cows, and they’re milked once a day. Cows at Kilgus and La Chevalerie (where I worked in France) were milked twice daily, for the cows’ comfort, but Michael said the calves stay with their mothers at TPC for so long and drink too much milk from their mothers to milk twice a day. 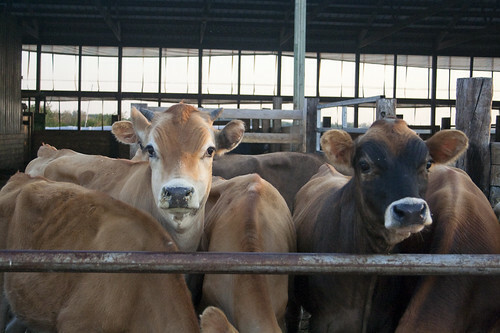 TPC raises Brown Swiss cows, some crossed with Jerseys, because of their high butterfat content (third behind Guernsey and Jerseys) and their suitability as both dairy and beef cattle. 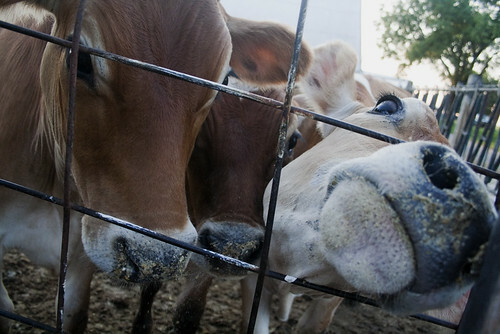 They’re pretty, too, and they dance while they’re milked. It took about 2 hours to milk all 60 cows. They’re fed molasses while being milked, because they love it and because it gives them good sugars, and feeding them even a small portion of grain during milking would contribute to a significant drop in essential CLAs, “conjugated linoleic acids” or “good fat.” I my opinion, the embrace of good fats is one of the greatest contributions of the organic movement to changing the way we think of healthy foods. Traderspoint had the most thorough milking process of any dairy I have seen. 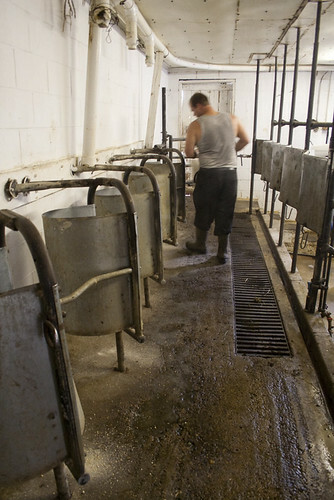 Each cow’s teat is cleaned with a pre-dip of hydrogen peroxide and water, then “stripped,” which means the teat is milked briefly by hand to test for mastitis, a very contagious infection of the udder. 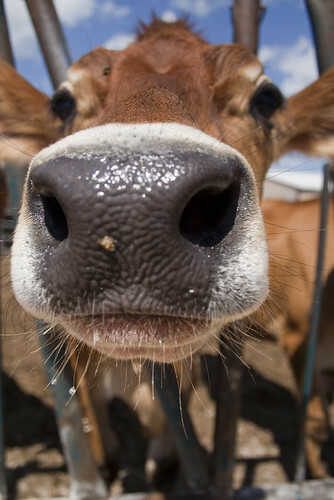 If an udder is mastitic, the milk is clotted and yellow, and it really smells awful. According to Amy Rhodes, my tour guide and fantastic later morning hostess, 70% of confined, grain-fed dairy cows are mastitic. In TPC’s herd of 60, only 2 that I saw this morning had teats infected with mastitis. 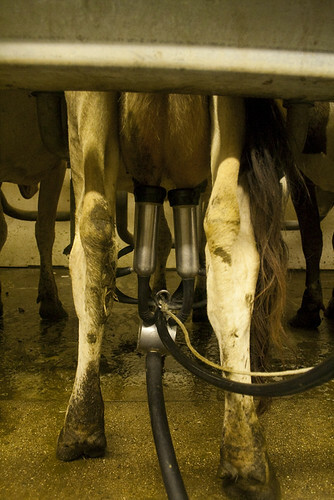 After they’re milked, each teat is dipped again in iodine to prevent infection. 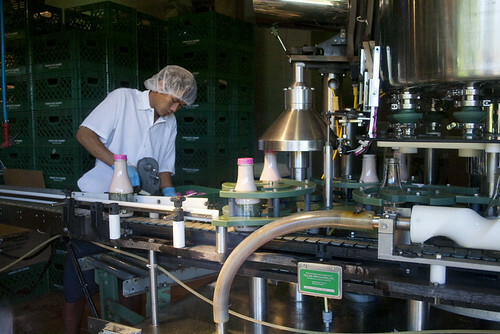 The milk is cooled in the holding tank from body temperature of 105°F to 35°F until it is pasteurized and processed into bottled milk, yogurt, cheese, or ice cream. Like Kilgus, Traderspoint pasteurizes their milk using the High Temperature Short Time (HTST) method of keeping the milk at 163°F for 20 seconds. Neither dairy homogenizes their milk, either, a characteristic much more important to me when drinking milk or making yogurt, because homogenization breaks apart the milkfat molecules and reduces the product’s creamy taste and nutritional balance. 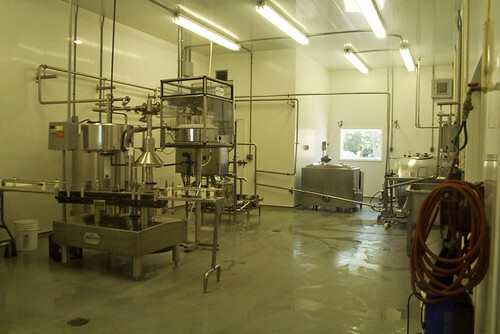 Traderspoint Creamery processes 150-200 gallons of milk every day. A herd of 60 milking cows does not product that much milk, so two other organic, grass-fed farms bring their milk to TPC in a co-op arrangement to meet demand. The demand is real. I sat on the front porch of the Creamery Barn after my tour and setting up for Amy’s tasting, shoveling the generous remains of blackberry ice cream into my mouth from a quickly-melting carton. Norm, the farm gardener and beekeeper, described mouthwatering ways to prepare omelettes and pasta sauce with TPC’s three flavors of creamy “fromage blanc.” And their two aged cheeses, Fleur de la Terre and a new raw milk aged Gouda, have been winning awards from organizations like the American Cheese Society since Fleur de la Terre was awarded Best Farmstead Cheese in 2007. The demand is real because the food really is good. I ate a delicious dinner and lunch at the farm’s Loft Restaurant, splurging for non-fried food since I was oh so tired of eating fried on-the-road food all week. 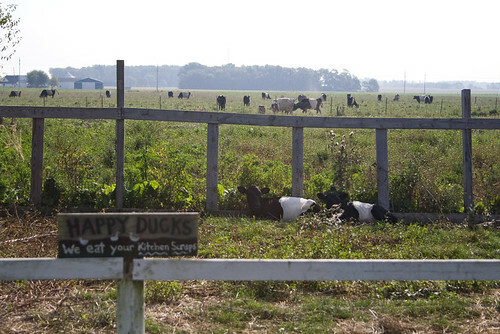 In addition to the cows, TPC keeps a flock of Rhode Island Red and White Rock chickens, which are pasture raised year-round, and whose eggs exclusively supply the Loft’s popular Sunday brunch. They also, as all dairies should, have two pigs, Gwendolyn and Melinda, which I fed with Arturo after strategically skipping out before milking cleanup began. Before I left, I spent some timing scooping ice cream and fromage blanc for a big event tasting, and I rewarded myself by taking a dip in the picturesque pond hidden right in the middle of the farm, then had a lunch of grilled cheese with a side of cottage cheese before biking into Indianapolis. I always loved Kilgus Farms milk when we sold it at Open Produce. It was delicious, affordable, and it tasted cared for…although I can’t describe exactly what gives it that character. Now that I’ve been to Kilgus Farms, I can say for sure that it is cared for. What a wonderful place. I arrived early in the afternoon, with enough time to find Matt and his wife Jenna and aunt Carmen, and to have an ice cream before going on a tour of the farm with staff from Bistro Campagne, a restaurant in Chicago. We started in the store, which is self-serve and open every day except Sunday – this is where to get that amazing soft-serve ice cream, the perfect afternoon pick-me-up on a hot summer day, as well as their fantastic milk, cream, yogurt, and plenty of cuts of meat. 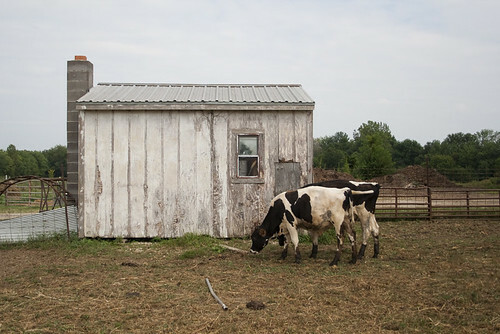 In addition to their herd of Jersey dairy cows, the Kilgus’ raise goats and pigs for meat, some of which is sourced by Chicago restaurants. We get Kilgus Farms milk in Chicago through a distributor called Natural Direct; they source regional, sustainable, small producers of dairy, meat, and other grocery products like delicious jams and organic eggs. They are a small distributor that focuses on distributing local products. A truck comes twice a week from Natural Direct to carry Kilgus products to various stores, restaurants, and businesses in Chicagoland. Stores like Open Produce have personal relationships with representatives from each distributor (and we order from nearly a dozen distributors for different products), so we are able to ask Sid particular questions about the quality and availability of regional products without having to know every farm in the area. 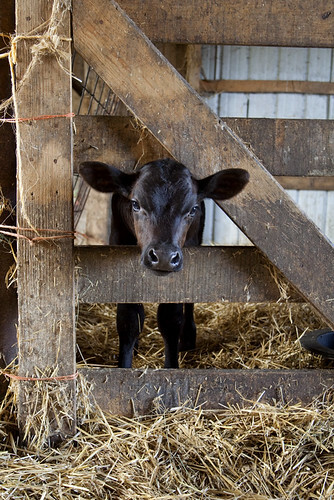 The farm has been in the Kilgus family for three generations, but they only recently switched the herd to Jersey cows, and they started bottling their own product in June 2009. Now they milk 3000-3500 lbs of milk every day and sell about 2800 gallons of milk (and milk products) every week. The milking herd consists of about 95 cows, but the farm is home to another 95 cattle that are either dry or too young to milk. 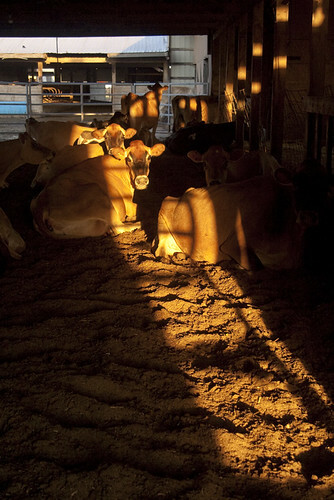 Cows can be milked as young as 2 years old, and the oldest milker at Kilgus farms is 12. This is an advantage of the Jersey breed, but Matt also points to pasture raising in increasing the cows’ longevity. 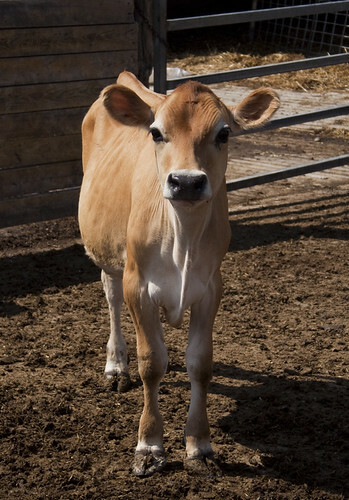 Jersey cows are my favorite; they are beautiful, with a creamy coat of brown and white, and huge, expressive eyes — and my beloved Chevalerie cows are Jerseys. They are the smallest breed, and they give less milk than other breeds, but their milk has the highest butterfat and nutrient content, and Justin, who took me out later to bring the cows in for milking, suspects their smaller size makes them hardier in warmer climates. These cows are raised on pasture from April to November, and fed twice a day, when they come in for milking, a mixture of non-GMO corn silage, alfalfa hay raised on the farm, and a protein/vitamin mixture. 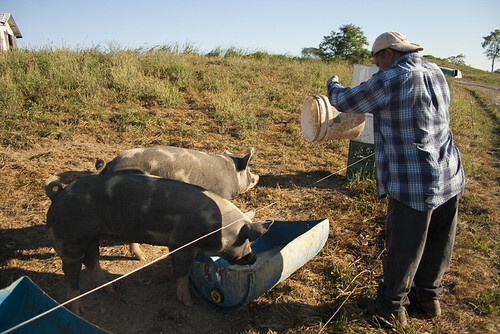 They rotate around 17 2.5-acre paddocks every 24 hours. While bottling on the farm may be new to the Kilguses, this is the seventh year of rotating grazing. Their milk is not organic – to raise animals organically is expensive and very difficult, given the many inputs of feed and processing – but mostly because if a cow gets sick, Matt gives them antibiotics and keeps their milk out of the milking stream for a while. In a land of cornfields, the Kilgus family are pioneers. They are successfully – although slowly – breaking into the niche market in the region for sustainable, local, family-farmed milk products and processing everything on the farm. And everyone there was exceedingly kind and so hardworking. After our tour, and some errands in town, I started to make yogurt. Matt pulled out a half gallon of straight Jersey milk for me to use, which I eagerly accepted. 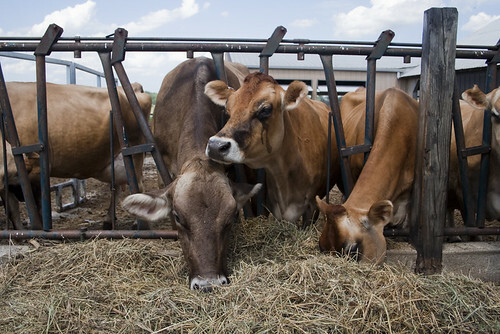 Jersey milk has a higher milkfat content than whole milk sold in grocery stores; straight from the cow it has 4.5 to 5% milkfat, but grocery store “whole” milk is required to have 3.25% milkfat. 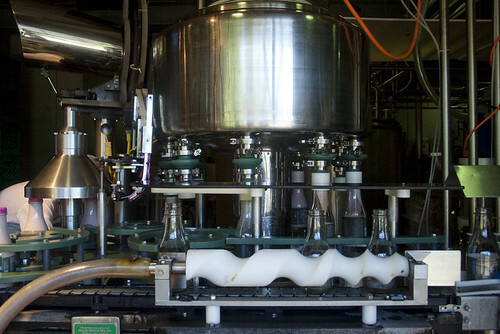 All of the Kilgus milk is pasteurized and passed through a separator, which uses spinning discs to separate the heavy cream from skim milk – like a preliminary stage of homogenization, which completely destroys the milkfat molecules so that cream will never form on top of the milk. Once heavy cream and skim milk have been bottled, whole milk is added to the skim milk in stages to make the 2% and “whole” kinds. I got to use some of the 4.5% true whole milk for my yogurt, which I made in Matt and Jenna’s backyard, with their daughter Camlin supervising carefully. Once it had cooled and I had inoculated it and set it to incubate in the garage, I left it for the night. The next morning, I got up early…although not as early as nearly everyone else. At 5:30 a.m., an hour after milking started, I pulled myself upstairs and across the street to the farm. 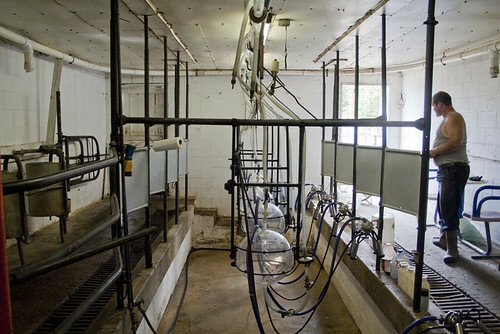 The others were hard at work, cycling the cows in and out of the milking room, 10 at a time, on either side of the room. I was impressed at how patiently and eagerly the cows waited to be milked, filing in and out of the milking room, which had raised floors for the cows on either side of a central milking galley of sorts. After watching for a bit, I grabbed some cloths and started wiping off the iodine solution sprayed on their teats to clean them before milking. The machine had the same kind of extremely-awkward mechanism as the milker we used in France, so it felt familiar but was still, like I said, awkward, and I tried my best not to slow up the hour-and-a-half milking process. After the cows left and before the next 10 were let in each side, they sprayed off any dirt or feces that had gotten on the walls or floors. 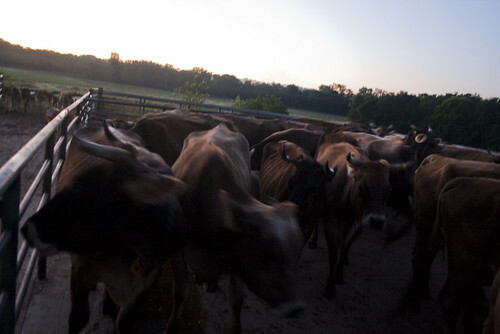 As the last cows were hooked up, I left the comfort of the motors running and the warm, sweet, bitter smell of cows and fresh milk to get some pictures of the other animals in the early morning sun before heading off. Everyone was so much more energetic in the morning, before the afternoon heat had settled in, and I tore myself away as I realized I’d forgotten to take my yogurt off the heat at 6:30.